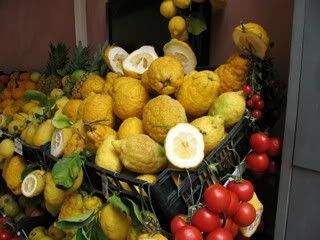 What an incredible duplication of the lemons I had the pleasure of experiencing in Italy - as my husband and I dubbed them, "lemons on steroids." This refreshing, citrus fragrance has the distinct honor of smelling of lemons without reminding its wearer of Pledge. Lacking sweetness and instead offering an intense, fresh, warm and zesty lemon scent, this could make a great layering scent or summer essential for citrus lovers. Unfortunately, at this price point, you had better really, really love lemons. Profumum Acqua Viva is available at www.luckyscent.com. A 100mL bottle retails for $215. Image: my own of a street market in Sicily. To give perspective, these lemons were about the size of a large grapefruit. I so agree! Is it terrible that I simply cannot justify paying that for what is a lovely lemon scent? Yes!! It's gorgeous. Somebody quick! Arrange a six-part bottle split!